Summary : A surprisingly good and refreshing traditional green tea that beats the pants off of other store brands in the traditional green tea line. Review : I've really come to like teas from Tazo. Reason? Tazo, while putting out bagged teas, without question puts out better bagged teas than the competition - or the competition that you find here in the United States. Yet, I'm always wary of traditional green teas. You know the type - those rather awful teas you get in a chinese restaurant somewhere. In most chinese restaurants, drinking the green tea that is served is a superb way to hate the meal that soon follows. Yet, the name of "Tazo" carried the day, so I worked up the courage to try their Chinese Green Tips traditional Green Tea. Unlike Tazo's Zen Green Tea, nothing is added to this tea. As such, this is about as "pure" of a green tea that you will find. The pureness of this tea shows up in the ingredients, as it contains a single ingredient - green tea leaves. No infusions. No "natural flavors." Nothing. Just green tea leaves. Now, truthfully, I really didn't have high hopes for this tea. As nothing was added to the tea to give it a little flavor, I was truly expecting to get the taste of a typical chinese restaurant tea. This was only reinforced by the rather weak aroma of the tea leaves before brewing. Yet, happily, I was wrong. This tea is advertised as having a "delightful fresh taste" and, you know what, that is exactly what this tea has. This really is a delightful and light-tasting green tea. Now, admittedly, I do like Tazo's Zen Green Tea better as I'm a spearmint junkie. Yet, I still liked this tea. I liked it a LOT. For tea drinkers who want to gain the health benefits of green tea, but have been repeatedly burned by "cheap green teas" for those of chinese restaurants, I urge you to give this tea a try. It is light tasting and, probably more than any other bagged green tea you'll find in the grocery store, comes about as close to tasting like a "pure green tea" as you'll likely find. If you do want a bit more flavor to the tea - this tea is most definitely light tasting and has little after taste - you can spice up the tea a bit with a flavorstick or a tiny amount of sugar. 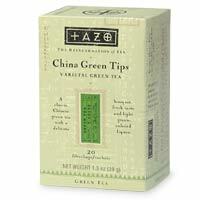 Or consider trying Tazo's Zen Green Tea, which has more punch due to the addition of spearmint leaves. Recommendation : Yes. A green tea that tastes exactly as advertised. Light and refreshing. A very good green tea for tea drinkers searching for a pretty "pure" green tea with nothing added which actually still tastes good. Brewing Instructions : Pour 1 cup boiling water over tea bag. Let brew 3-4 minutes. Note, when brewing most green teas, you do NOT use boiling water. But, the instructions were clear on the box - use boiling water. So I did. Also note, do NOT overbrew - otherwise a bitter taste awaits your future. I went 3.5 minutes and it was the perfect brewing time.